Bernie & Phyl's Furniture Blog » REJUVENATE YOUR DINING ROOM IN TIME FOR THE HOLIDAYS. REJUVENATE YOUR DINING ROOM IN TIME FOR THE HOLIDAYS. Accommodating a large crowd of family and friends can be tricky. If your dining room typically seats 4-6 people, creating room for more requires planning and ingenuity. Consider adding bench seating! A stylish bench adds versatile space for two or three adults. Plus, kids love them too! Some bench models include handy storage space, doubling their utility. Flexible table lengths are a convenient way to make room for guests whenever you need it, and keep your table at an everyday size when it’s just you and your family. Butterfly and drop leaves make adjusting the table quick and easy, with self-storing leaves that don’t take up any additional storage space in your home. Extension leaves range from 12”, 14” and even 18” sizes to add significant room at your holiday table. Mixing arm chairs with side chairs creates a versatile look while saving seating space around the table. Place arm chairs at the ends of a rectangular table while arm chairs provide comfortable seating in between. Add a stylish bench to the table for a charming, playful look! Check out this set for a fabulous example of this design. How can you feed a crowd and store your dishes, flatware, wine glasses and serving utilities without creating a major inconvenience? 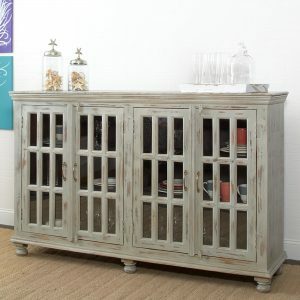 Consider adding a server, sideboard, buffet or hutch for your dining space! A buffet offers ample top space for your family and guests to serve themselves. Drawers and cabinets with adjustable shelves provide you with the flexible storage space you need to stay organized year-round. A full-sized hutch provides all of that plus a display cabinet to showcase your collectables, fine china and whatever else you want to highlight for your guests! A server or sideboard is designed specifically to help organize your dining room space, and often include hanging wine glass racks and wine bottle storage in addition to the versatile extra counter space you want. As a bonus, these pieces can provide a stylish contrast with your existing dining room furniture. Have a contemporary set now? Consider mixing in a bit of industrial chic. If you have a more traditional dining room style, an elegant piece like this one may add a flourish. If you want to add a fun accent to your dining space while showing off your hometown pride, this Boston-centric server is wicked perfect! How can you rejuvenate your dining space with subtle touches? Add an accessory! From area rugs to lighting fixtures, a couple of accessory pieces will enliven any design style. A new lighting fixture, whether a chandelier or pendant light, can add a burst of style to your dining room! What time is it? A wall clock can provide a pop of color and style while adding a useful feature for you and your family. We hope you find these suggestions helpful and inspiring. Happy Holidays!